There aren’t many jobs out there that I covet: Prime Minister, Head of the British Library…that’s about it. 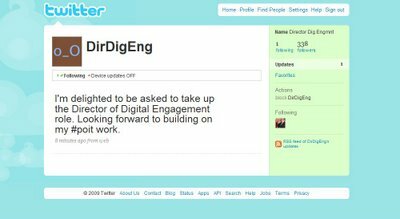 Or rather, that was it until the government started advertising for a Director of Digital Engagement (via NevilleHobson). All the excitement of social media with the potential to make a real difference to people’s lives…and the £120,000 starting salary wouldn’t hurt either. Well Francis, when the ‘recession bites’ it is more important than ever that channels of communication with the government are opened, and [with the exception of myself] you are unlikely to get someone who knows what they are doing for less than £120,000. Maybe the Conservatives would like to take the opportunity to put aside party politics and acknowledge that it is an important role in the future of government. So, who is your money on as the future Director of Digital Engagement? My money is on Alastair Campbell, recently seen blogging and twittering on a site near you. Whilst I sent him a message on Facebook about an hour ago asking him, he has yet to reply. Other potential candidates? Possibly Charles Leadbeater, but personally I would prefer someone who has their social media feet more firmly on the ground.